Security audit in our case is am automatic technical assessment of our server and web applications in the context of security by performing security vulnerability scans, reviewing application and operating system access controls some softwares or scripts. At the ens, we will gather a software generated audit report. Here is how to perform security audits on Ubuntu 16.04 with Lynis and other tools which are appropriate on cloud server’s shared environment. Security audits are often included in regulatory compliance, like with legislation of HIPAA, such acts specifies how an organisation must secure system. MacOS X and FreeBSD supports audit event logging with use of OpenBSM library. Definitely there are paid third party costly services. However, they are not practical for day to day checking as we do not need certification. We have some free tools like Lynis, auditd. 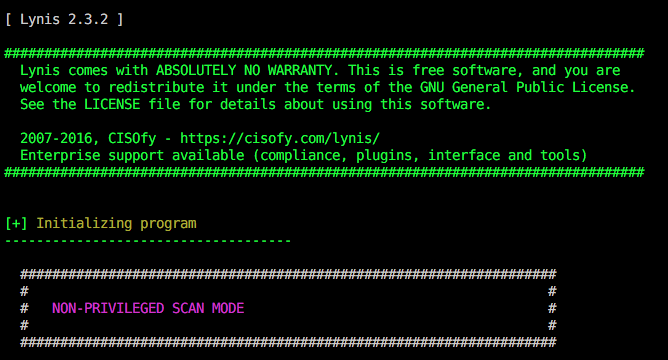 Lynis is a host-based free security auditing application to evaluate security profile of GNU/Linux systems. Cloud servers itself not 100% secure as guest OS. How host is secure, that also determines the security. In our case, the reason to use these tools to have an overall idea of vulnerability to protect from common attacks like bruteforce, attacks by script kiddies. Running security audit tools usually consume a good time and patience. We suggest to read through the whole article before running the commands to install Lynis on server. Lynis uses HTTPS repo only and we need apt-transport-https installed for it. I must inform you that this package may give Fix E: Sub-process /usr/bin/dpkg returned an error code (1) error upon update, upgrade later, which we have an odd fix – Fix E: Sub-process returned an error code. Reverse situation is also true. Lynis will check everything like system tools, startup services, run level, loaded modules, kernel configuration, zombie processes, group IDs, sudoers, PAM configuration, vulnerable/upgradable packages, security repository, iptables, Apache, SSH configuration, MySQL root password, php options, cronjob, SSL certificate expiration, malware scanners, shell history files and so on. This Article Has Been Shared 5779 Times! Here is a List of Linux Server Security Hardening Commands For the New SSH Users & New Sysadmins. Guide is For Cloud & Virtual Instances. Snapshot as a word originated from photography. In computing, snapshot is the copy of a system at a particular point in time which can be restored in some way. Cite this article as: Abhishek Ghosh, "How To Perform Security Audits On Ubuntu 16.04 (With Lynis)," in The Customize Windows, June 6, 2017, April 21, 2019, https://thecustomizewindows.com/2017/06/perform-security-audits-ubuntu-16-04-lynis/.